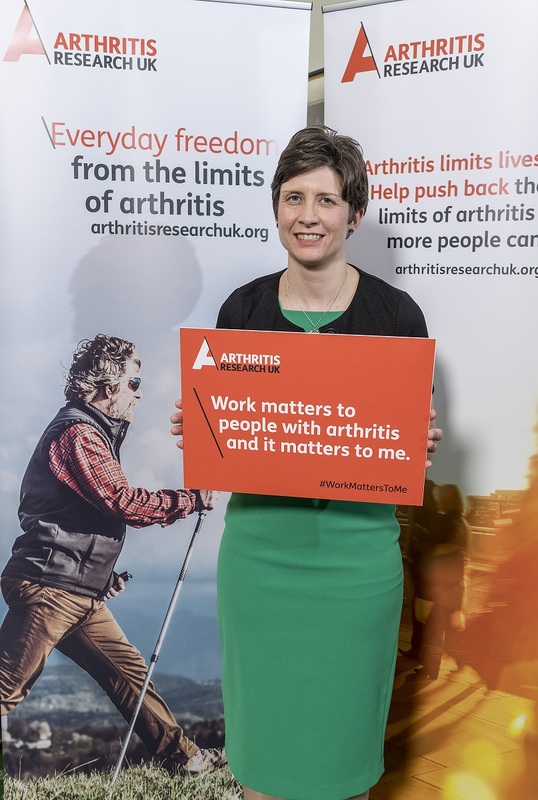 Arthritis is the number one cause of pain, disability and working days lost, according to Arthritis Research UK, which highlighted the issue to Alison Thewliss MP at a recent parliamentary briefing. Arthritis and other musculoskeletal conditions like back pain affect one in six of us. “It’s clear how enormous the impact of arthritis and musculoskeletal conditions is on our local communities. The ability to work is something that we often take for granted, but I’ve learnt today that for those living with arthritis this can be an incredibly difficult task. Undoubtedly thousands of local people with conditions like this want to work, but do not always have the necessary support to be able to do so. “I’m delighted that Alison Thewliss MP is supporting our campaign to give people with arthritis the freedom from their condition in employment, enabling them to live their life to the full. “The current situation for people living with the daily pain of arthritis is untenable. Arthritis and musculoskeletal conditions such as back pain are the number one cause for workplace sickness absence in the UK. “Our retirement age has increased and we’re an ageing working population, so even more people are going to be living with the pain and unpredictability of arthritis, and face an uncertain working future. “But with the right kind of support and job; work can benefit your mental and physical health as well as financial position.